The latest reviewed version was checked on 16 April 2014. There are template/file changes awaiting review. Apples are a very important food in all cooler climates. To a greater degree than other tree fruit, except possibly citrus, apples store for months while still retaining much of their nutritive value. Winter apples, picked in late fall and stored just above freezing in a cellar or "fruit room" have been an important food in Europe and the USA since the 1800s. Apples come in many varieties and flavors. 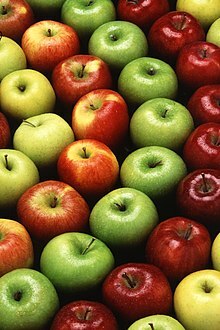 There are more than 7,500 known cultivars of apples. Cultivars are available for subtropical and temperate climates. Apples do not flower in tropical climates because they have a chilling requirement. A Red Delicious apple, cut in half lengthwise. Tastes in apples vary from one person to another and have changed over time. As an example, the state of Washington (United States) made its reputation for growing 'Red Delicious' apples. But in recent years other cultivars have steadily grown in popularity; many have come to regard 'Red Delicious' as an inferior apple of excessively bland flavor and soft texture. Such people have gravitated toward crisper apples such as 'Fuji' and 'Gala'. Modern apples are rarely sweeter than older cultivars; most modern apple breeding has concentrated more on high yield and commercial presentability - uniformity of color, size and shape, and the ability to withstand transport with minimal bruising (tough-skinned), with little thought given to eating quality. Most North Americans and Europeans favor sweet, subacid apples, but tart apples have a strong minority following. Extremely sweet apples with barely any acid flavor are popular in Asia. Many newly developed apple cultivars are soft but crisp. Other traits desired in modern apple breeding are a colorful skin, absence of russeting, ease of shipping, storage ability, high yields, disease resistance, typical Washington 'Red Delicious' apple shape, long stem (to allow pesticides to penetrate the top of the fruit), and acceptable flavor to the average person. Old cultivars are often richly flavored, but are commercially unviable due to low yield, poor transportability, and poor appearance, often being oddly shaped, and russeted and have a variety of textures and colors. Some old cultivars are still produced on a large scale, but many have been kept alive by home gardeners and farmers that sell directly to local markets. Many unusual and locally important cultivars with their own unique flavor and appearance are out there to discover, such as 'Egremont Russet' with its richly nutty flavor; apple conservation campaigns have sprung up around the world to preserve such local heirlooms from extinction. There are cultivars of apples cultivated specifically for producing cider. Cider apples are typically too tart and astringent to eat out of hand, but they give the beverage a rich flavor that ordinary eating apples cannot. Apples can be canned, juiced, and/or fermented to produce apple juice, cider, vinegar, and pectin. Distilled cider ("hard cider" in North America) produces the spirits applejack and Calvados. Apples are an important ingredient in many winter desserts, for example apple pie, apple crumble and apple cake. They are often eaten baked or stewed, and they can also be dried and eaten or reconstituted (soaked in water, alcohol or some other liquid) for later use. Puréed apples are generally known as applesauce. Apples are also made into apple butter and apple jelly, and are also used cooked in meat dishes. In the northern hemisphere, the apple season starts in July with the early cultivars, which are harvested until August. Later cultivars are harvested until October. Since apples store exceptionally well under refrigeration they are available out of season without much effort or loss of flavor. Apple recipes can be found in the apple recipe category.